Waka Flocka Flame: The Leader Of Hip-Hop's Tea Party Movement : The Record A rapper from Atlanta rejects nuance and lyrical skill for hard, rough rhymes and finds an audience. 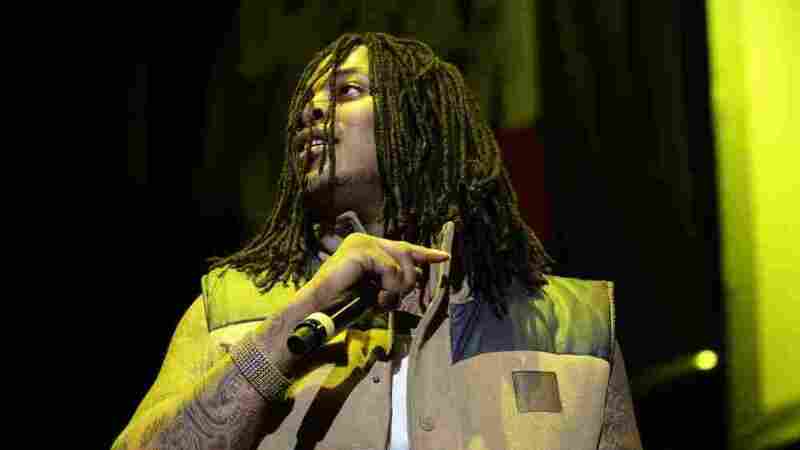 In These Streets: Waka Flocka Flame on stage at WGCI-FM's "Big Jam 2010" concert in Rosemont, Illinois on December 19, 2010. Anyone who names himself Waka Flocka Flame is clearly not afraid to be ridiculed. And the rapper who goes by that name has indeed become one of the most reviled and mocked of recent years. But Waka Flocka Flame has also built up an equally fervent and loyal fan base, who take that scorn and ridicule as a badge of honor, and have embraced Waka Flocka as their leader in a culture war of sorts against hip hop's intellectual elite. Waka Flocka Flame comes out of the Atlanta hip-hop scene, which in the last 20 years has come to rival New York and California as a mainstay of the hip-hop industry. Atlanta has produced rappers like T.I., Ludacris and OutKast, who show that a Southern rapper can have all the complexity and sophistication of their New York counterparts. In recent years Atlanta has also given birth to a very different generation of rapper, including Gucci Mane, OJ Da Juiceman and Soulja Boy -- who basically thumb their nose at all that northern sophistication with a far more raw and simplistic style of rap. Waka Flocka Flame has become the rapper that carries that anti-musical, anti-intellectual hip hop to its ultimate conclusion. Waka Flocka's Atlantan elders -- like Outkast or Ludacris -- would use a song to showcase their verbal dexterity and lyrical complexity. On his hit songs, Waka Flocka Flame shouts some the simplest couplets imaginable, mixed with an "ad lib" track full of wordless grunts and growls that often threatens to drown out the lead vocal (over a beat that sounds like the marching band that might accompany the four horsemen of the apocalypse as they destroy the Earth). Check, "Hard in da Paint." For Waka Flocka's detractors, that lack of musicianship and absence of lyrical skill represents everything that's gone wrong in hip-hop music with this younger generation. Waka Flocka's fans would point to that extreme simplicity as something that adds to the emotional catharsis his raw, aggressive music provides. So for those who still struggle to make sense of Waka Flocka Flame, think of him as the leader of hip-hop's Tea Party movement. The other Tea Party has built up a passionate following by appealing to people's desire to rebel against the Washington elite, and to vent its frustration with the establishment by aligning themselves with outsiders who hold up their lack of Washington's traditional qualifications as the most attractive asset you could have. A movement fueled only by catharsis can be hard to sustain in the long-term, and you might well question whether Waka Flocka Flame or the Tea Party will still be viable around 2012. But for the moment it shouldn't be hard to understand the allure of the untutored outsider that's made Waka Flocka Flame such a big hit. Those Americans who can't align themselves with the Tea Party might even want to try Waka Flocka Flame, as an alternative way to shout their stresses away.